The Colour Card allows you to fill the scene's background with a solid colour when there is no background image. If no drawing or colour-card is present to cover the scene's background, the scene will be rendered on a pitch black canvas. NOTEBy default, the Colour Card has a Z ordering value of 12 Backward. This puts the Colour card behind all elements that have a value lower than 12 Backward. Most of the time, the Colour card will appear automatically behind all the scene elements as they are all set to 0 Backward, unless you have changed the Z ordering of the scene components. If so, the Colour Card will be in front of the elements that are pushed back to more than 12 fields backward. The Colour Card does not need to be connected to anything in your scene. 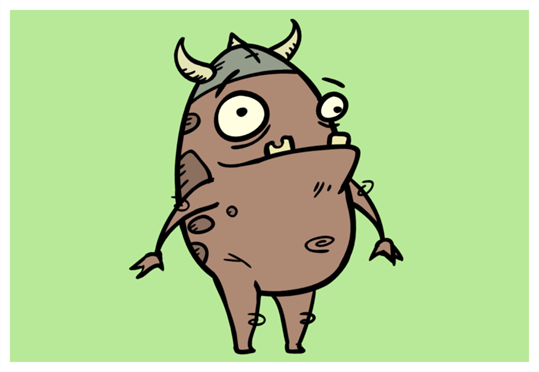 It simply needs to be added to it alongside your drawing layers and groups. Because a Colour Card has a default position on the z-axis of 12 Backward, it will appear behind all the layers in your scene regardless of whether or not it has layers underneath it. This parameter can be used to determine whether the colour card displays behind or in front of elements with the same position on the z-axis. Offset Z The position of the Colour Card on the Z-axis. By default, this is set to 12 B to ensure the Colour Card appears behind other elements in the scene. You can set this to 0 F to make the Colour Card respect the order of the layers in the Timeline view. Opens the Colour Picker window in which you can specify the colour. 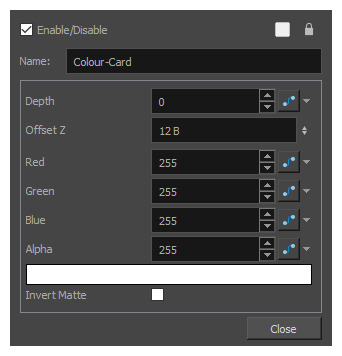 Invert Matte If an image is connected to the Colour Card's matte port, by default, the colour is only applied on the opaque areas of the matte. If this parameter is enabled, the colour is applied to the transparent areas of the matte instead.